EiffelSoftware Open Source - Difference between revisions of "Main Page"
Welcome to the central resource for EiffelStudio developers and contributors. EiffelStudio is an open-source IDE for the Eiffel programming language. Eiffel Software is the principal contributor and hosts the subversion repository. EiffelStudio is maintained and developed by Eiffel Software as well many contributors, including ETH Zurich. Complete compiler for the Eiffel programming language, with Design By Contract (DBC) support and both high compile-time speed and high-performance executables, based on the Melting Ice Technology. Many other libraries of reusable component. 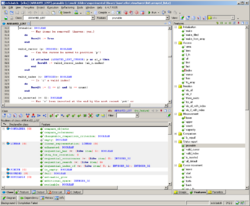 The Eiffel compiler creates C code that is then handed to a standard C compiler. As a result, Eiffel programs have a run-time performance comparable to those directly written in C or C++, but with the benefits of an advanced object-oriented model and strong typing. EiffelStudio uses a highly efficient compacting garbage collector to free the developer from the burden of memory management. If you want to know more about the unique features of Eiffel and EiffelStudio, check out our Reasons for using Eiffel page. EiffelStudio testing process: you can participate!